Transparency Market Research has released a new market report titled “Toluene Diisocyanate Market - Global Industry Analysis, Size, Share, Growth, Trends and Forecast 2015 - 2023.” According to the report, the global toluene diisocyanate market was valued at US$ 6.72 Bn in 2014 and is likely to reach US$ 10.27 Bn in 2023, expanding at a CAGR of 4.8% from 2015 to 2023. In terms of volume, demand for toluene diisocyanate stood at 2,231.5 kilo tons in 2014. Toluene diisocyanate is the primary raw material used in the production of polyurethane products. Polyurethane products are utilized in numerous applications in various end-user industries. Rise in demand for toluene diisocyanate can be primarily due to rising demand from the bedding and mattress industry. Automotive seats is the other major end-user industry that is anticipated to provide major impetus to the toluene diisocyanate market. Limitations concerning the supply and volatility in prices of raw materials are estimated to offer key opportunities to market players. In terms of demand, Asia Pacific dominated the global toluene diisocyanate market in 2014, accounting for about 40.2% share in 2014. Increasing demand for automobiles in Asia Pacific is anticipated to drive the demand for toluene diisocyanate that is used in the production of flexible foam. Additionally, the bedding and mattress industry has witnessed significant growth in the region in last few years, and the trend is expected to continue in the near future. 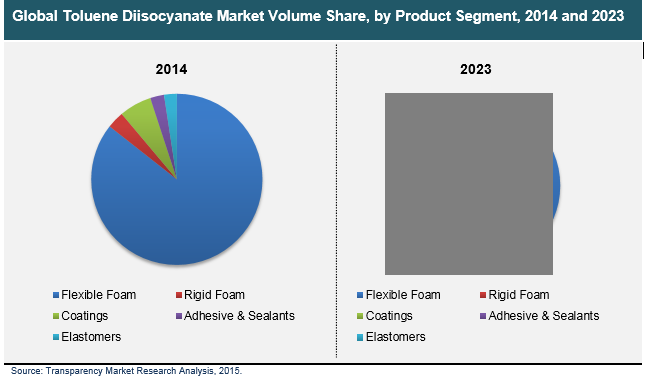 Growth in the bedding and mattress industry is projected to boost the demand for flexible foam and subsequently, the toluene diisocyanate market. Hence, the market share of Asia Pacific is expected to increase and is anticipated to reach 42.2% share of the global toluene diisocyanate market in 2023. Asia Pacific was followed by Europe, which held about 29.3% share of the global toluene diisocyanate market in 2014. Europe has been an established market for flexible foam, which is especially used in bedding and mattresses. Rise in demand from the bedding and mattress industry is anticipated to boost the demand for flexible foam in Europe in the next few years. Countries in Eastern Europe are projected to primarily drive the demand for toluene diisocyanate in the next few years. North America was the third-largest region, constituting about 20.9% share of the global toluene diisocyanate market in 2014 and is expected to reach 20.2% in 2023. Demand for toluene diisocyanate in North America is anticipated to increase at a CAGR of about 3.9% from 2015 to 2023.Major players in the toluene diisocyanate market include The Dow Chemical Company, Mitsui Chemicals, Inc., and Huntsman Corporation.